House Party: Host a Green Works House Party (Apply Today!)! 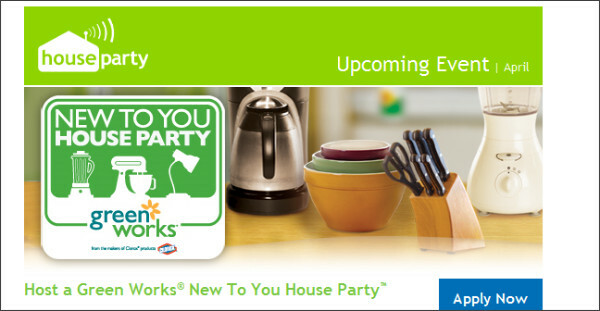 Head on over here to fill out your application to host a Green Works New To You House Party! If you are lucky enough to get picked, you get to host a party on April 16, 2011 where you and your guests exchange "green" housewares by swapping gently used items! What a neat idea! You will be supplied with a FREE party pack with favors, goodies & tips & more! Good luck & let us know if you get picked! Enter To WIN: Clinique High Impact Mini Mascara!! Subway Footlong Nation Win FREE Subs for LIFE!! FREEBIE: Maggi Chicken Soup Sample for FREE! GIVEAWAY: 50 Custom Brochures from Uprinting.com! FREEBIE: Lacoste Perfume!! Joy of Pink!! Free Love on Valentine's Day!!! Deals to Share!! !